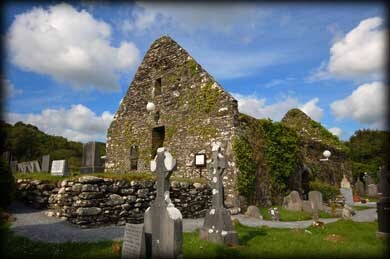 The medieval church at Ballyvourney is the next stop for the pilgrims doing the rounds. The church is built on the site of an earlier church. The pilgrims would stand at the northwest corner of the earlier foundation ststion 5, shown left, and pray. They say 7 Our Fathers, 7 Hail Marys and 7 Glorys at each station. After station five the would circle the old church in a clockwise direction saying a decade of the rosary. Station 5 would be visited four times and the other stations once. Station 6 is at the window of the east wall of the chancel, where the altar once stood, see image below. After this station the pilgrims would circle the church again stopping at station five for the second time. They would then re-enter the church and pray at the window in the south wall of the church, station 7. At this station they would reach their arm out through the window and rub the sheela-na-gig above, which they believed to be an image of St Gobnait. 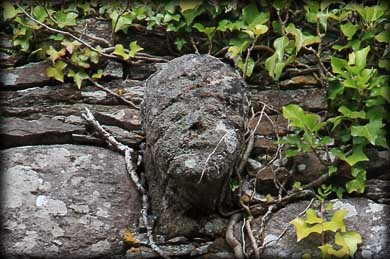 Ireland has the largest number of Sheela na gigs. They are mainly found on castles and churches and its believed they kept evil spirits away. The carving is beleved to be from about the 15th century. There is also a mask, shown below, that came from an earlier romanesque church. This carving is known as the Black Thief. After circling the church and stopping at station 5 for the last time they would then visit at station 8. Station 8 is on the outside of the south wall where the chanel meets the wider nave. We unsure about this station, but it may be another part of the earlier foundation. Station 9 is at the south side of the west wall of the church just at the top of the steps. 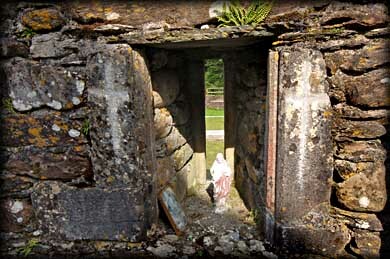 Embedded in the wall is St Gobnait's Bowl, which the pilgrims can reach in and touch. This was the bowl St Gobnait allegedly used to destroy a fort that a local chief tried to build near her monastery. 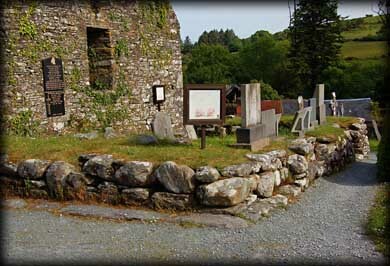 For the final station pilgrims would walk to station 10, St Abbans Holy Well. The turas takes place on the 11th February each year. Tradionally each year the parish priest brings out a 13th century wooden statue of St Gobnait and the pilgrims measure a ribbon against the statue and wrap it around the figure. Then they would take the ribbon home and use it for healing purposes. 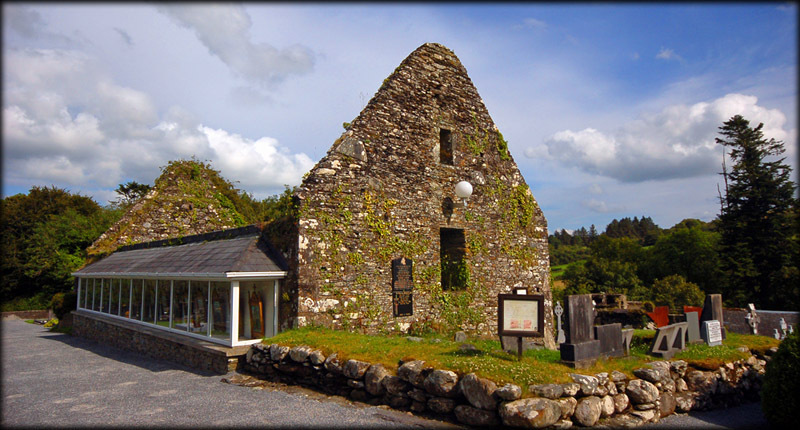 Situated: From Macroom, County Cork travel west on the N22 towards Kerry. 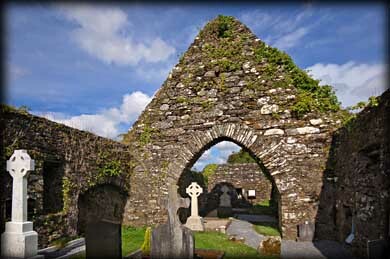 Go through Baile Mhic Ire (Ballymakerry) and after the church on your right take the next left turn signposted. After 400 metres you will come to the first holy well. Take the next right for the Church. Discovery Map 79: W 1976 7686. Last visit July 2011.